As Onset's highest accuracy data logger, it provides twice the accuracy of previous models, a deployment-friendly LCD, and flexible support up to four external sensors for measuring temperature, current, CO2, voltage and more. 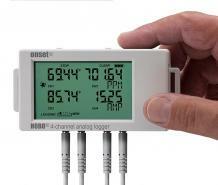 The logger is ideal for energy audits, building commissioning studies, equipment scheduling, and more. There are a range of standard sensors, or use a third party sensor with one of the voltage of current input adaptor cables.